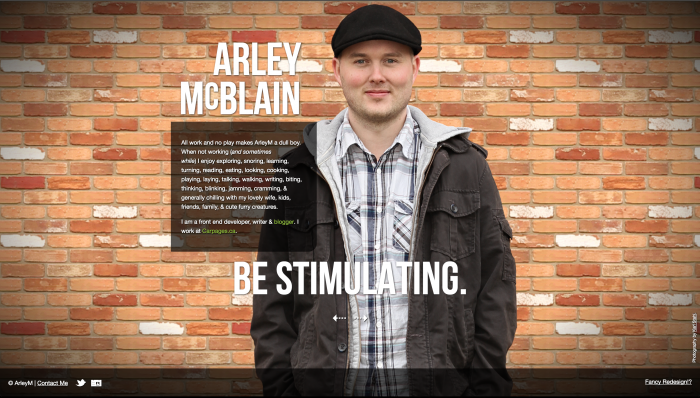 It’s website refresh day for ArleyM.com! I love the old adage about the mechanic’s car being a clunker. It’s true of every developer and designer I know most of the time. This is the eleventh version of arleym.com which first went live in 2003; the domain name was a gift from Tim Lum. I’m replacing a previous design that launched in 2012. The classic “responsive text” page is still live here at http://arleym.com/rwd, in part because I was recently humbled by a college professor who says she still uses it as an example of unusal things that can be done with media queries. This new layout is pretty clean and will hopefully be easy to scale. I really like the flexboxin’ header and footer that change layout responsively; I don’t think I’ve seen this done before (but originality is really hard, I can’t imagine I’ve done anything that ground breaking here).